Those were the words of Eclipse’s Steve Hyde on Sunday afternoon at Silverstone. It was one of those.. character building weekends for a race team. 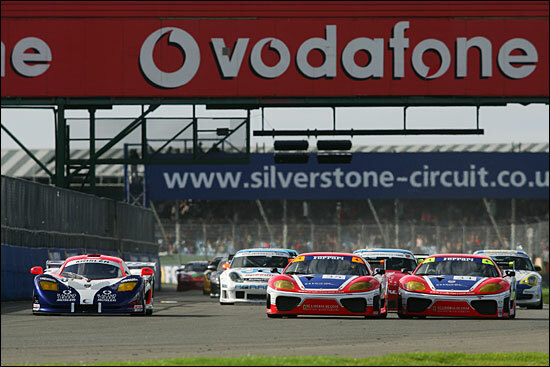 It was the last event of the 2005 British GT season, and in an ideal world, the team would have gone out on a high. 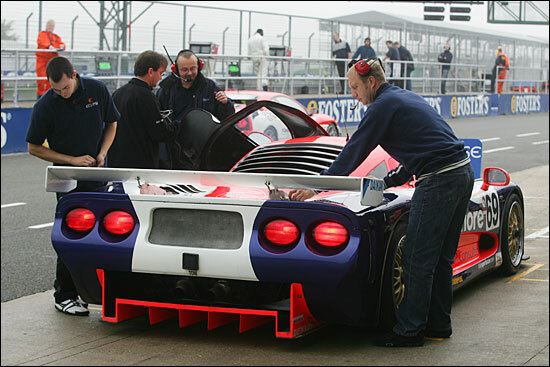 But testing on Friday saw the most unexpected occurrence on (in) a Mosler – a connecting rod appeared through the block of the V8. That just doesn’t happen – but unfortunately, it did. Martin Short, the Mosler importer, managed to solve the problem: “They borrowed my engine,” he explained. That was rushed down from Breckland Technologies in Norfolk, and a late night from John Griffiths and the crew saw the engine installed, ready for the 75 minute session on Saturday morning. It was a brand new V8, so times weren’t top of the priority list – running it in came first: seventeenth fastest was completely unrepresentative of the car’s potential. Chris Pollard would have preferred more running (in) time before qualifying and Saturday’s race, but the schedule demanded that both drivers set times in the short qualifying sessions. 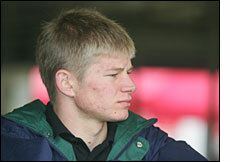 Steve Hyde (above) was out in the first one, and he encountered gearchange problems. ”A fatigue problem, easily fixed,” explained Breckland’s Mike Rawlings. Phil Keen (left) proved that point by setting the third best time in the second session (to set the grid for Sunday’s race), with a 1:22.803. He was the only man remotely close to the times of the Scuderia Ecosse cars, eight-tenths adrift of Tim Mullen in the #34 Ferrari 360. 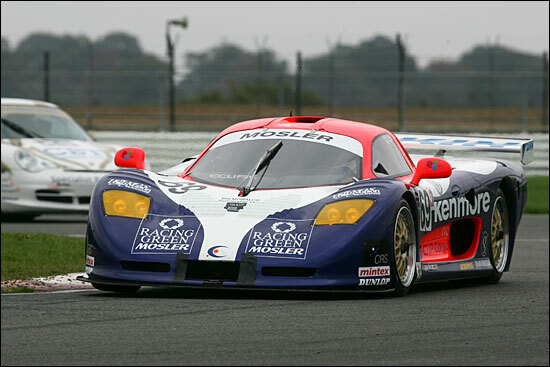 What an effective combination Keen and the Eclipse Mosler have been this year. Unfortunately, Phil didn’t get a chance behind the wheel on Saturday – in the wet. The rain arrived midway between qualifying and the race, and it just got wetter and wetter and wetter. From 17th on the grid, Steve Hyde had aimed to take it gently early on, stay out of any GT3 trouble, then work his way up the order. He was stranded out on the circuit, on his seventh lap, and that was that for Saturday. Sunday had to be better than this, surely? Yes, it was. A bright, sunny day – and a bright start to the race from (third on the grid) Phil Keen. He went barreling up the inside of those two Ferraris at Copse, the one on the outside (Mullen) running out of road. Then he ran out of road at Becketts, and, like the Irishman, slipped down the order. 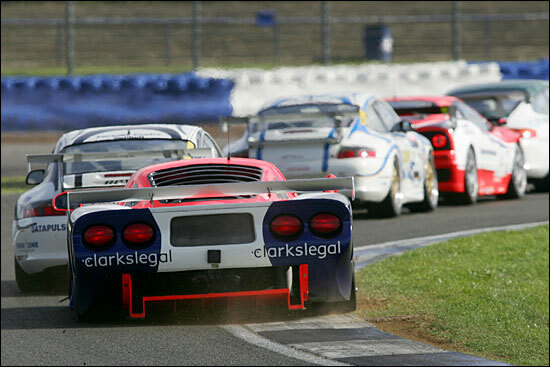 Now we had some real racing though, as the Scottish Ferrari and the Eclipse Mosler fought back through the GT3s, then the bulk of the GT2s. They went at it as a pair, but as soon as they’d worked their way up to the Embassy and Eurotech Porsches in second and third, Phil Keen passed the Ferrari, and took up his role as the dominant challenger. 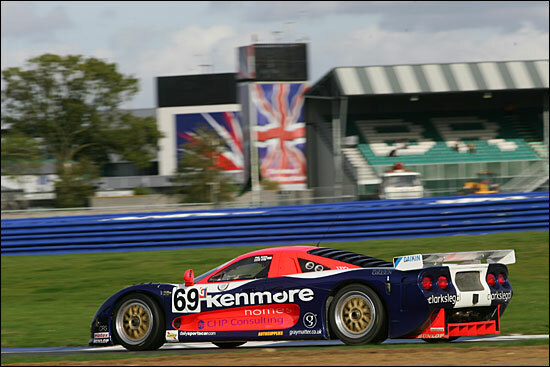 He passed both of the Porsches, so by the completion of lap 15, the Mosler was second, 22.5 seconds behind Kirkaldy in the #35 Scuderia Ecosse Ferrari. That gap came down – to 21.7, then 21.5, then 20.9. This was looking very promising. 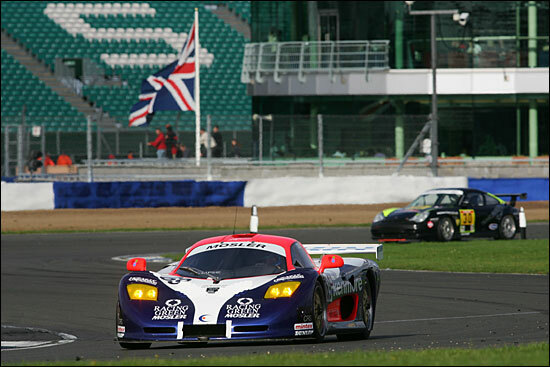 Phil Keen took the lead when the Ferrari pitted, and then the Mosler came in after 22 laps, for Steve Hyde to take over. Steve emerged in a strong fourth, content to let the pros. in those two Porsches thrash away in their battle for second, but looking good for a fourth at the flag. “Then I locked up on a downchange, into the Abbey hairpin,” explained Steve Hyde, later. “It was one of those things that almost never happens, but after the weekend that we’ve had… it happened. 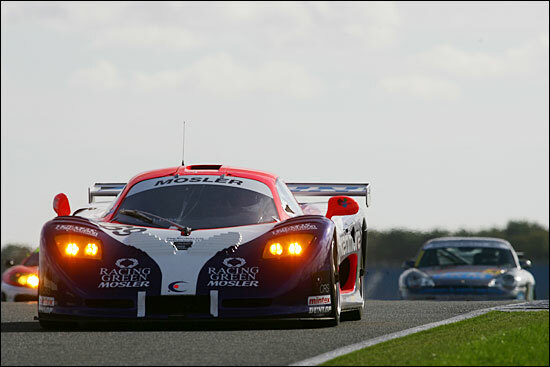 No harm done (other than the lost time), but the Mosler came home sixteenth on the road: in a one hour race, there’s no chance to make up a deficit. On a bright note, Phil Keen’s best lap was within half a second of the best Ferrari lap, and half a second faster than either of those Porsches. 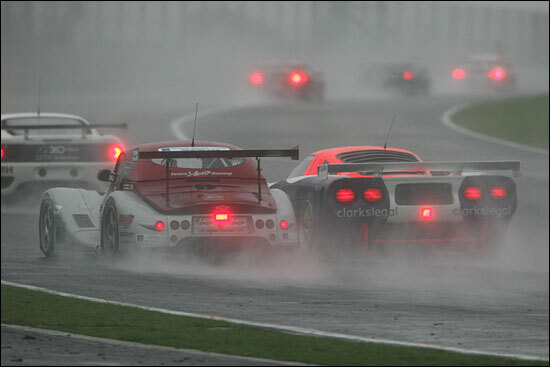 The Mosler is a very effective GT2 car – but sometimes a team goes through ‘one of those weekends’. This was one of them – but prospects are very bright for 2006. Chris Pollard and John Griffiths will announce the team’s plans in due course.